As the LoL World Worlds 2017 participants provide epic battles on Summoner's Rift and teams around the world begin their preparations for the upcoming LCS Spring Split 2018, Riot Games has already announced their plans for the near future: the 2017 League of Legends All-Stars tournament is already waiting in the wings. From December 7th to 10th five fan-chosen players from the top eight regions of the World Championship will be competing against their rivals as a regional dream team. However, while in the past few years fame and fun were in the centre of attention rather than prize money and competitive aspects and above all the fans in front of the screens benefited greatly from the crazy game modes, the All-Stars tournament 2017 is experiencing some fundamental changes. The fancy game modes are a thing of the past – only the duels on Summoner's Rift and the 1-on-1 tournament in the Howling Abyss will remind the innumerable fans of better times. Also the popular Uber-Teams Fire and Ice bid farewell in 2017, each dream team will now fight for their own and their home region. When asked why the change in tournament format takes place, Riot Games replied: “In previous years, the focus of All-Star was primarily on entertainment over competition. This year, our 2017 All-Stars will be playing to win. We feel that pulling them out of their competitive mindset to play one-off, fun game modes will inherently divert their focus and take away from the competitiveness of the main event.” Nevertheless the fans can still vote for their regional heroes that participate in the duels and the annual All-Stars tournament creates friendships between fans and players from all over the world. We will keep you up to date with the latest information and wish you a lot of fun with the League of Legends (LoL) All-Stars Tournament 2017! The All-Star Tournament 2017 consists of two parts, the Main Event and the 1v1 Tournament. In the main event, the teams from the eight regions mentioned above will be divided into two groups, with each team playing three Best-of-1 in the Group Stage. The two best teams from each group will be promoted to the Semi-Finals, which will take place in a Best-of-3 format. In the Final, the Semi-Final winners will meet in a Best-of-5. In the 1v1 tournament, the coaches select two players from each region. These 16 players start immediately in a Knockout Stage, with the first two rounds being played in Bo1. In the Semi-Finals and Finals a Bo5 will be used. This tournament is always well received by the fans, because the games are short and do not contain any tactical elements but only the mechanical skills of the players are shown off. This year again the fans from all over the world will decide the regional dream teams by casting their votes in the All-Stars voting which is running from November 6th to November 10th, but in contrast to the past tournaments of the last few years each spectator can only vote for the players of their own region. In addition, the players of each region may choose a coach for their team who will then help the team at the tournament. More information about 2017 All-Star Voting can be found here. The fans have already spoken and most of their decisions were clear and unambiguous: the heroic challengers of the eight teams participating in the 2017 All-Stars tournament have finally been decided. Nevertheless there are some surprises – PowerOfEvil was able to claim the Midlane crown for the first time in Europe after xPeke retired and made room for young blood in the EU LCS. IgNar was also able to play his way into the hearts of the European fans with brilliant performances at the League of Legends World Championship 2017 and will now represent his region on the support position. Surprisingly, the LCK All-Stars team consists of only one player from SK Telecom T1 but Faker in the Midlane is probably the moste popular player in the world. MikeYeung makes his first appearance on the North American squad, Sneaky won the voting against Doublelift for the AD-Carry position. Of course, after his excellent performances at the World Championships AD-Carry Uzi gets another international appearance wearing the jersey of the Chinese LPL. Most of the challengers participating for the Wildcard teams are well known players with a lot of experience and will definitely spice this tournament up. Only the GPL team is still missing – the voting results for Southeast Asia will follow soon. The players are of course allowed to choose the coach for their team. Of course our renowned online betting sites will once again offer betting odds for the 2017 League of Legends All-Stars tournament and we will keep you up to date with new informations right here. 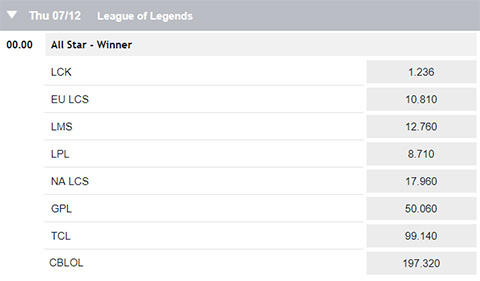 In the meantime you can also read about the possibilities to bet on League of Legends games. Bet365 and Pinnacle have been the first to provide us with odds. In 2017 all matches of the All-Stars tournament will be broadcasted via live streams. Therefore we will of course introduce the tournament's commentators and analysts team to you. You can watch all matches of the tournament right here for free, the red dot in the top right corner of the streaming player signals that the live broadcast is up and running. The exact starting times and results can be found later on at the All-Stars 2017 schedule.